To Chew Or Not To Chew… We’ll answer that question! 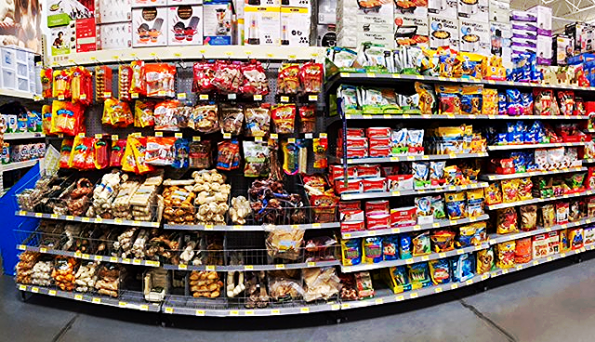 Satisfying a dog’s need to chew is a big, profitable business… our advice, skip this aisle completely! Stick with natural options. Our home generally has 5-10 dogs of assorted ages and we frequently foster young puppies. Nearly everyone knows that puppies really like to chew. They’ll chew on virtually anything they can get their razor sharp little teeth on. What many people don’t know is that the very best time to shape what an adult dog will enjoy chewing on, is while they’re puppies. But even if you don’t start out with a puppy, almost all dogs can learn to enjoy “recreational chewing” their entire lives. Chewing is a great hobby for dogs. It relieves boredom and stress, exercises their jaws, and if you choose wisely – it helps extend the time needed between dental cleanings. Offering several good options is a great way to get your dog to enjoy chewing on things that are both healthy and safe. Start early: If you’re lucky enough to start with a puppy, creating a chewing preference is pretty straight forward… just repeatedly offer those things that you want your puppy to enjoy chewing on. Start with the really good stuff: For very small puppies, start with high value things like Bravo Dry Roast chicken strips, a marrow bone, or feed meals in a stuffed Kong. Swap out the wrong choice of chew toy for something better: If you find your puppy chewing on something like your new shoes, get a happy voice going and just swap out the shoe for a bone, antler or kong. If you “puppy proof” your home and supervise lots in the early days, your puppy will learn to prefer to chew on the good things you provide. Old dogs can learn new tricks: We foster adult dogs all year long and they all eventually learn to love chewing on bison bones. Why? Largely because they’re all over our house, and they see the other dogs doing it! 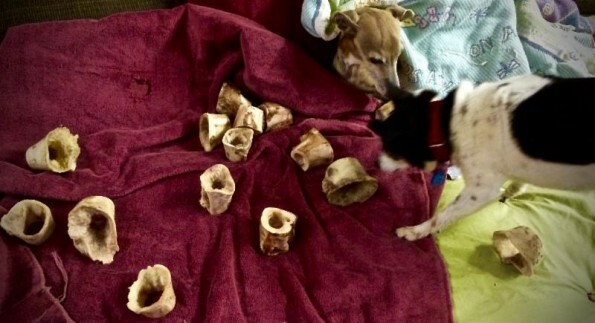 To create bone “junkies” start at meal time: Dogs who have been eating commercial dog food their whole lives might not know what to do with a real bone. The first step is to thaw the bone, and then let them have a new bone in place of a meal. 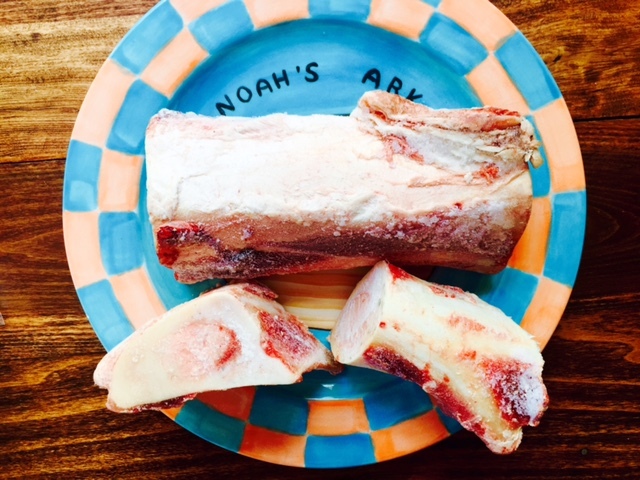 The marrow from these bones has about 120 calories per tablespoon, and it’s very nutritious. A little hunger will motivate most dogs to give bones a try. There’s always a bone to pick at the Todd’s! 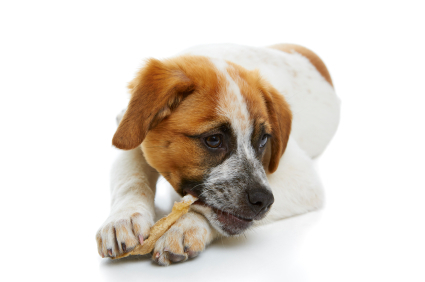 Once dogs learn to love bones as a meal replacement, they keep on chewing them, even after they’re picked clean! Change chewing choices: Once your pooch has one or two healthy options for chewing, you can offer more variety and even start feeding them from Kongs or other food dispensers. Why create a champion chewer? It’s true, dogs who chew appropriately generally have healthier teeth and gums, but the biggest benefit of having a champion chewer is that it’s a great way to combat boredom and alleviate stress. It’s much like human children who can sit with a coloring book and crayons and enjoy themselves for an hour or more. In fact, whenever you leave your pet alone, be sure they have something to chew on. To Chew or Not to Chew…. Buy larger, thicker Bison Bones so they don’t get stuck like this one did! BISON BONES- Raw frozen bison bones are wonderful for satisfying a canine chewing habit. They’re available frozen at Noah’s Ark- just thaw and serve-NEVER COOK. They provide great exercise for the jaw, they’re relatively inexpensive at $3.50 per pound, and very long lasting. Best yet, regularly used, they do a great job of delaying the time between dental cleanings – a real money saver! Be sure to use the larger, thicker bones from Noah’s Ark, and choose a size big enough that it can’t get stuck like this one did! At Noah’s Ark we carry two sizes, but even our smallest dogs are happy to drag around very large bones. DEER ANTLERS– Elk and deer antlers are a great natural and healthy chew option for dogs. Available whole and split, they’re a bit expensive but we’ve been surprised by how much our dogs are attracted to them, and how long lasting they are. 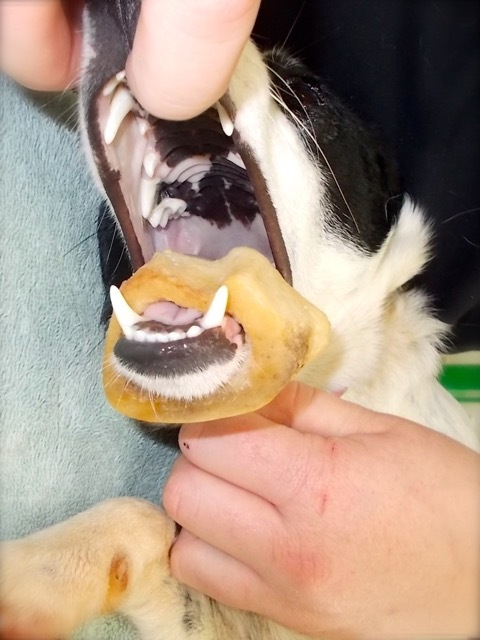 Start first with split antlers so that dogs have easier access to the marrow, then graduate to whole antlers for more aggressive chewers. Always supervise your pooch until you understand how aggressively they’ll chew a new item. Available at Noah’s Ark for $13.00 – $19.00 for a pack of two antlers. BULLY STICKS– These go in the category of a special treat chew. These high protein chews come from bulls – however they can add significant calories to your pampered pooch’s diet. Depending on the thickness of the stick, there are 10 – 20 calories per inch of bully stick. We recommend bully sticks primarily for small dogs. Most large dogs can quickly consume the whole stick. Be sure you supervise your small dog chewing a bully stick, and do not let them consume more than 1/4 – 1/2 of the stick in a day. Take the stick away when it gets down to a piece small enough to choke on, and always purchase bully sticks mede entirely in the United States. Available at Noah’s Ark for $5.50 each. RAWHIDE: This perennial favorite requires a heavy chemical process to create and has no nutritional value. Rawhide is a frequent cause of intestinal upset. Click here for a more detailed explanation of why we advise you to steer clear (pardon the pun). HOOVES– Click here to learn why you should never offer hooves. SMOKED BONES– Some dogs have consumed the entire bone quickly and required surgery to extract the resulting blockage. These bones tend to be quite messy and expensive. While most dogs can digest raw bones just fine, these bones have been heat treated, so they’re not particularly digestible. COOKED BONES– While many dogs have raided the trash and lived to tell the tale, bones that have been heated or cooked become hard, brittle, and undigestible to dogs and cats. Pieces swallowed can cause the same issues as hooves. PIGS EARS– Ears tend to be consumed very quickly, don’t really satisfy a chewing need and they’re extremely high in fat and calories. Most sold in major retailers are processed in China.